When I was little, going through my mom's button drawer was one of my favorite pastimes. I loved anything glittery, pretty, or shiny... and not much has changed. This summer, she let Sarah and me totally raid her fabric scraps stash and button collection. We got a TON of gems and the possibilities are endless with these kinds of treasures! Sarah showed up later with these fabulous turquoise earrings and I loved them. She then told me that they were none other than some of the buttons we found from my mom with earring posts glued on them. Of course, I was on my way to Hobby Lobby shortly thereafter to get the necessary supplies. Baggie of 100 earring posts with backs included? Somewhere around $3. Hot glue? A household staple. 30 minutes later, I had 10 new pairs of favorite studs. 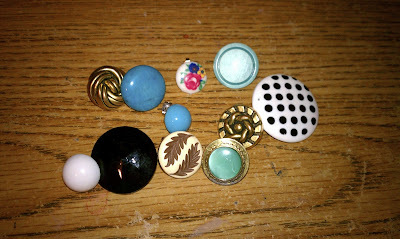 Next time you need a jewelry fix, I suggest the button stash. You're so lucky to have a sister with such great ideas!! J/k I still wear those turquoise ones ALL the time and now that I can put my hair up in a pony tail (Yay!) I think I'll wear more studs! Thanks for stopping by :) Love your blog! Oh this is such a cute idea! I have a whole mason jar of buttons from my Grandmother dating back to the 1920's. I've just always kept them in the jar as a remembrance of her, but never thought to make earrings. Heading to Hobby Lobby tomorrow!! Thank you for your sweet comment on my blog the other day! I'm so glad you did, I'm having fun perusing your space :) Hope you have a terrific weekend! This is SUCH a great idea!! I love it! Going to find some buttons now. This is an awesome idea! Love it, I may have to do this. Must find earring backs. I'm so glad you found my blog!! Your site looks like all kinds of fun....I can't wait to search around a bit. I'll be adding yours to my blog list on my site! I'm loving your new jewelry!- I'll be trying that out! such a fun idea! i'm always getting bored with my earrings!